We offer Bamboo Blue Round Box to our clients. Bamboo Storage Box, Size/Dimension: 4"x4"x5.5"
Orders are delivered after quality check. 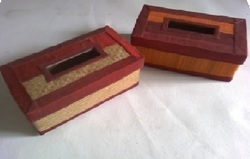 Handmade gift boxes of bamboo. The bamboo slivers are woven into an arrow design. Handmade and handcrafted. To match up with the requirements of our customers, we are indulged in offering a comprehensive range of Bamboo Storage Box to clients. 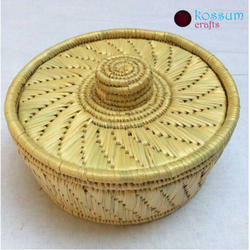 This Bamboo Storage Box can be used in kitchen to store grains and also spices. Besides, these products are of excellent quality and are available at market leading prices.